When it rains it pours. That’s when most people think about their rain gutters. Not when it’s nice and sun shiny in southern California. Coastal towns such as Carlsbad, Encinitas, Cardiff and Del Mar experience near perfect weather mostly year round. But it does rain on the coast. Oh yeah it does! And when the rains come, so do the floods if your rain gutters are not up to par. During nice weather it’s easy to forget about your rain gutters. They get overlooked until needed. Our job is to help you remember to maintain your rain gutters throughout the year so that when you need them, they are there for you, functioning properly and doing their job of protecting your home and property. While it’s best to hire a professional service for gutter cleaning, here’s what you need to do it yourself: To clean your gutters yourself you will need to get on a ladder. Hidden hazards to watch out for are electrical lines, sharp objects and bee’s nests. You should wear work gloves and have a hose handy to clean your gutters. 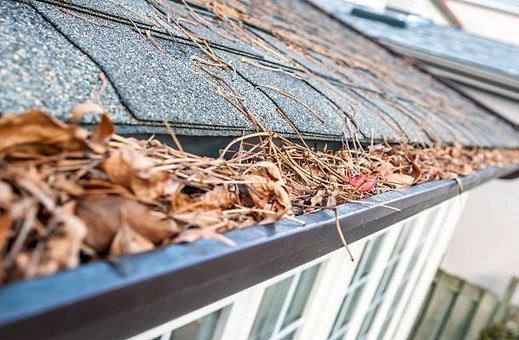 If you notice that some gutter areas are loose, you can tighten them up as you go. If you’re afraid of heights then you really should consider hiring professionals to clean and maintain them for you. – You have to put your hands in a dirty gutter that may be full of leaves, sharp edges or nails and screws, bee nests, etc. The pros outweigh the cons when you think of how much money it will save you to take care of them. Also, to hire a professional gutter cleaning service to take care of them for you improves the pros even more. Maintenance includes regular inspection, cleaning and repairs as needed. A quick monthly visit is best, but once every 3 month (quarterly) is fine. We inspect for age, wear, and sun damage, damage from falling objects, broken seams and leaks. Then we repair as needed. We clean leaves and other debris out of the gutters and downspouts so they flow water properly away from your home and structures. We also make sure the water from the downspouts are properly routed away from your home. During sunny times, we can come over when it’s convenient for you. Keep in mind that during rainy times we might be swamped (pun intended) and therefore response times might be delayed. So let us help you avoid possible future water damage and loss from broken, worn or leaky rain gutters. Call today for more information and to schedule an inspection of your gutters. You’ll be glad you did. Peace of mind is worth a pound of gold. But luckily our services won’t cost you that much! Phone (760) 445-8762 and ask for Greg Martin. Serving all of San Diego county, specializing in coastal North County including Carlsbad, Encinitas, Cardiff and Del Mar.